A lot of the time when we look at PC peripherals and accessories here on GameWatcher, it’s the high-end stuff. Mice that cost three figures are nice and all, but some users don’t want to spend that, or want a cheaper mouse they can give some abuse and not worry about replacing if it breaks. The Logitech G300 Optical Gaming Mouse is one of the better examples of that category we’ve seen. Priced at a conservative $39.99, this isn’t a mouse that’ll rival top-tier products from the likes of Mad Catz or Razer - but it still provides admirable performance at a fraction of the cost. Enthusiast gamers used to a myriad of customization options may find it a bit lacking, but anybody coming off an even more basic mouse will similarly likely find this to be a cheap little revelation. Some of its features are obvious cost-saving measures. While some high-end mice boast their wired nature is to reduce lag in pro-gaming settings, here it was obviously never an option on the table purely because of cost. The software, which I’ll cover later, is more simplistic - but the upside of this is that the mouse is entirely plug-and-play and functions fully enough without any extra software at all. Unlike many gaming mice, the G300 features an ambidextrous design that is as friendly for left-handed players as it is right. A sleek matte silver finish makes up the majority of the palm rest, while the sides feature a rubberised, textured surface instead - placing that squeezable feedback right where your fingers and thumb should be gripping down. A cool-looking LED runs along where the grip meets the rest of the mouse, and glows nicely in a bright but not distracting manner when in use. This LED strip isn’t any one set colour, and can actually be adjusted and serves a purpose in indicating to the user which of the pre-set modes the mouse is currently in. 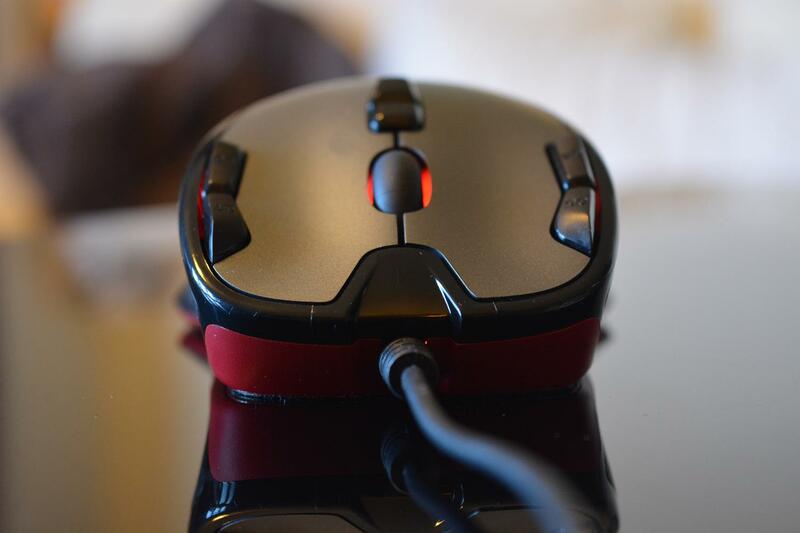 Red accents round out the look of the mouse. Comfortable to hold for long periods despite feeling a touch too small for my hand, the G300 has a sleek, stylish look to it that rivals the more expensive products on the market. The truth of its cost becomes more obvious when you pick it up; even compared to ‘performance’ mice that are deliberately designed light, this feels particularly hollow and light, though still with a sturdy construction that feels unlikely to break easily. If you’re a Windows user (Sorry Mac folk - you’re not supported) and choose to install the configuration software, it’s easily enough grabbed from Logitech’s website - in a move now becoming typical, no disc is included with the retail box. The software is more basic, but carries its essential features well and has a user friendly user interface that pretty much anybody remotely fluent in their PC’s features will be able to use. 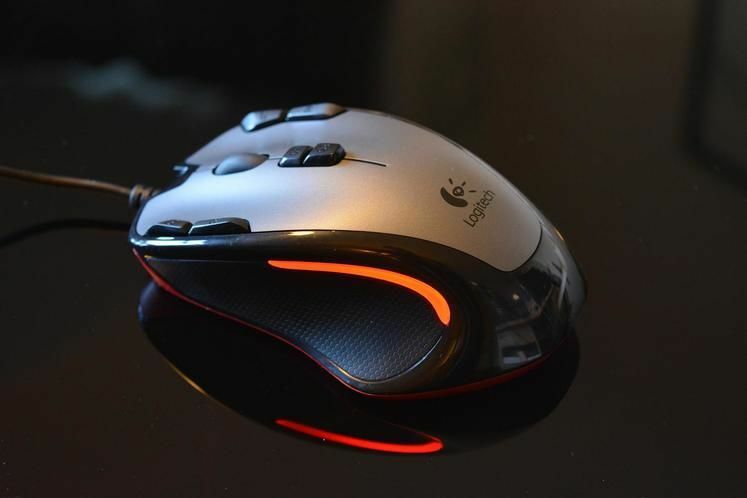 The G300 carries nine programmable buttons - the two clicks, a scroll wheel, two buttons behind the scroll wheel, and two buttons flanking both clickers. The software lets you adjust the functions of each button easily, allowing you to assign one of a number of pre-set buttons or - in a useful touch - assign a keystroke, such as Alt+Tab, to a single mouse button. There’s no more detailed macro functions than this, but one can immediately see the potential in some games, such as strategy titles, for programming keystrokes to mouse buttons. A couple of buttons, however, are likely best reserved for the DPI-adjusting functionality. The software allows the user to set one of four levels of custom sensitivity between 250dpi and 2500dpi, and one of the functions that can be assigned to buttons is to turn the DPI up and down between these four settings. There’s ultimately three presets for button shortcuts, each assigned a different colour of LED on the mouse itself - so when you switch, you know which one you’re using. When you’re done programming, a click of save will zap all these settings down to the on-board memory of the mouse. The great benefit of this is that it now doesn’t matter if the next place you plug in has the software or not - when you plug in, the mouse will carry all your presets with it. While it’s absolutely possible to ‘feel’ the price of the Logitech G300 gaming mouse in the density of its construction, the feature set it carries is an impressive one. It’s a perfect contender for a player looking for a gaming mouse on a budget or simply an entry-level gaming-friendly input without a high cost attached.